A practical system for growing and protecting wealth in today's volatile markets Martin Truax and Ron Miller are financial professionals, who unlike others in this field, have made money in today's volatile market. While stock markets have been down fifty percent, they've managed to be up seventy percent. This book clearly explains the highly successful portfolio management system used by the authors to protect their clients' wealth as well as garner substantial gains-by participating in profitable market opportunities when they occur. 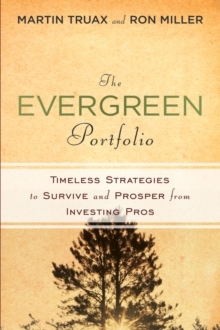 Divided into several informative and engaging sections, The Evergreen Portfolio reveals how you can use hedges to protect the long portion of your portfolio when the market starts to go down. It covers the tactical and technical methodologies needed to protect and grow your assets at a time when many investors are getting wiped out. * Discusses the keys to succeeding in today's market, including the best ways to invest in gold, diversify with foreign currency, and much more * Contains insights from top minds in the market such as Mark Skousen and Bob Precther * Offers an effective solution to the investment and retirement problems we all now face Written with the serious investor in mind, The Evergreen Portfolio reveals one of the best ways to protect and grow your money in a turbulent financial environment.